The guys on the left are two fourths of French pop sensation Phoenix - alround nice guys with a remarkable ear for making a catchy tune. The picture, though not taken by me, is from Danish concert hall Vega and I was in the audience. The concert was really good and they came of as really sympathetic, albiet a bit too un-edgy at times. On the other hand who cannot like a band who has made souch ace tunes as If I Ever Feel Better, Too Young, and Everything is Everything. Actually everything is a good description of what makes Phoenix so good at their particular brand of pop. It is almost impossible to find something which one can call a fault or lacking in Phoenix, besides affore mentioned lack of edga, but hey, they're French - They don't need edge! Todays two songs are from the album to be released on the 15. this month. It's going to be brilliant and I strongly urge you to buy it. First song is Lost and Found, a typical Phoenix song with its laid back tempo. 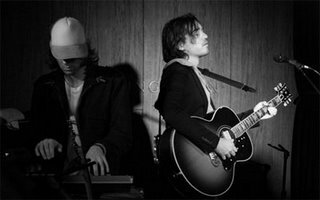 The song demonstrates a new found edge (Edge in the sense that the sounds of phoenix normally reminds the listener of butter) and lets the drums have more prominence than in previous songs. The second song of the day is yet another gem from the new album - This could also be a good bet for a single release. Sounds a bit like a new version of Too young which of course is nothing to complain about. This tune is instantly catchy, you get pictures of trendy people dancing at some private party in your head - oh how cool they are.